Close to the town of Bosilegrad in southeast Serbia. 100% Medgold. Fortuna Silver Mines earning into 70% by spending US$8m. Good access by forest roads, power available nearby feeding a producing Pb-Zn mine. 30 minutes from Bosilegrad, road accessible. Structurally controlled intermediate sulphidation Au-Ag(-Pb-Zn) mineralization, associated with a detachment fault, locally very high grade (>20g/t Au). Medgold has completed 13 drill holes. Best intercept: 30.0 m of 5.45 g/t Au. Phase 2 drilling underway and expecting to complete nearly 5,000m in 2018. The 2018 drilling continues to hit high grade gold, silver and base metal values over 10s of meters in all 13 holes with a best intercept of 30.0 m of 5.45 g/t Au. Drilling has intersected detachment-fault related, intermediate sulphidation Au-Ag-base metal mineralization, hosted by tectonic breccias developed along a regionally extensive, low-angle detachment fault. The Tlamino Project is located near Bosilegrad in the far southeast of Serbia. Medgold has two contiguous licences, Donje Tlamino and Surlica-Dukat, covering 192 square km. The Donje Tlamino licence hosts the two main targets, Barje and Liska. The Surlica-Dukat licence includes the Karamanica target. The modern exploration era at Tlamino began in the 1950s when Yugoslav state companies explored for lead and zinc. Precious metals were not commonly assayed for during this era. The property was subsequently drilled for gold by Avala Resources in the mid 2000s, but their drilling appears to have missed the main precious metal mineralization. 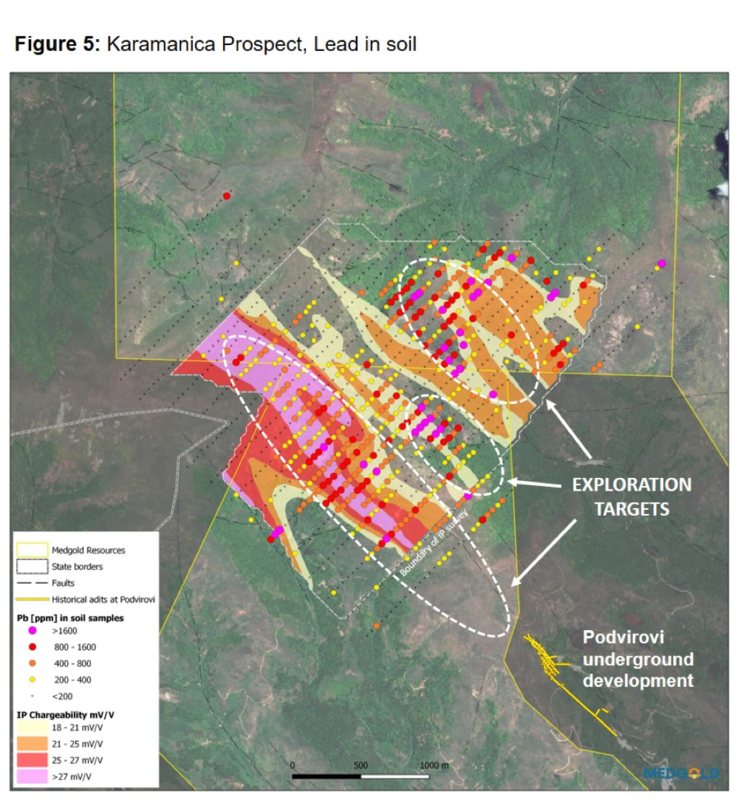 Medgold acquired the project in 2016 and over the next 2 years, focusing mainly on Barje, completed geophysics (IP), soil and channel sampling, prospecting and a first-pass 7 hole drill program in 2018. 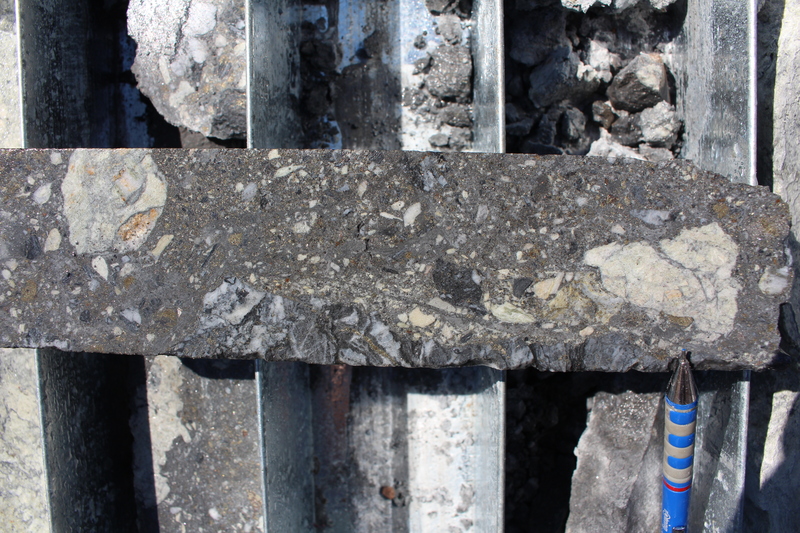 Channel sampling at what is now called the Discovery Outcrop (CH_BAR_01-11) returned a best channel interval of 84m at 5.6 g/t Au and 105.2 g/t Ag. 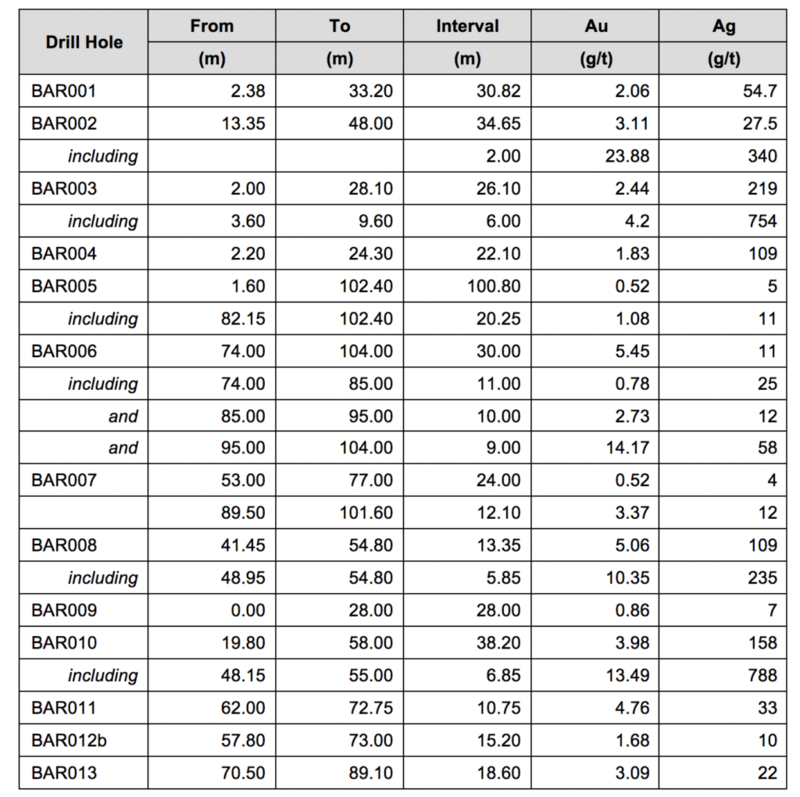 Medgold also channel sampled an old Yugoslav adit at Barje which returned 52m at 2.20 g/t Au and 88 g/t Ag. The 2018 drilling hit high grade gold, silver and base metal values over 10s of meters in at least 4 holes with a best intercept of 30.0 m of 5.45 g/t Au. All of the initial 7 holes hit gold. Drilling intersected detachment-fault related, intermediate sulphidation Au-Ag-base metal mineralization hosted by tectonic breccias developed along a regionally extensive, low-angle detachment fault. The licences are located in the Serbo-Macedonian Massif (“SMM”), a belt of metamorphic rocks that runs north-south through Serbia into Macedonia, Bulgaria and Greece. The belt has been intruded by felsic porphyry intrusives, volcano-clastics and dykes, and locally covered with recent conglomerates. The contact zones between the intrusive rocks and favourable country rock are thought to control the known base and precious metal showings within the licence areas. From the 1950s to the 1970s the Yugoslav government systematically explored the SMM for lead and zinc but not gold, opening up significant exploration opportunity for Medgold. 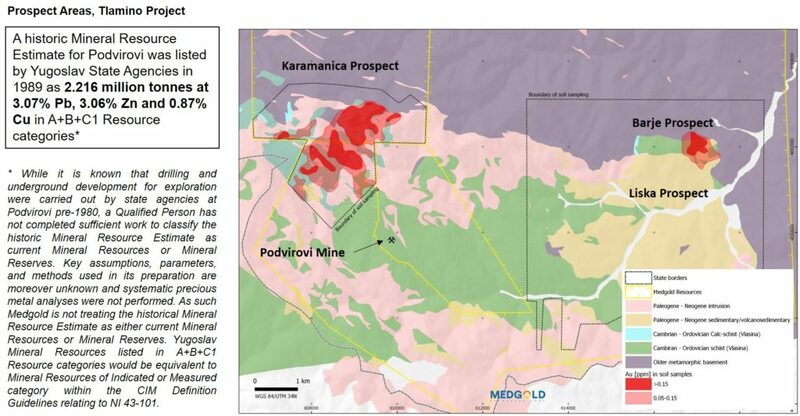 The SMM lies west of Serbia’s Timok Belt which hosts a number of copper-gold porphyry-epithermal deposits including Nevsun’s Timok porphyry. In Greece, the SMM hosts several gold deposits including the Skouries high-grade Au-Cu porphyry and the Olympias Au-rich, polymetallic carbonate replacement deposit, both owned by Eldorado Gold. The Liska and Barje prospects are both associated with the east-west striking low-angle Crnook detachment fault. Precious and base-metal mineralization is hosted by tectonic breccias developed along the detachment fault. Mineralization occurs as irregular veinlets and patches hosted in partly silicified and sericitised tectonic breccia. The sulphides are mostly dominated by pyrite, arsenopyrite, galena and sphalerite. 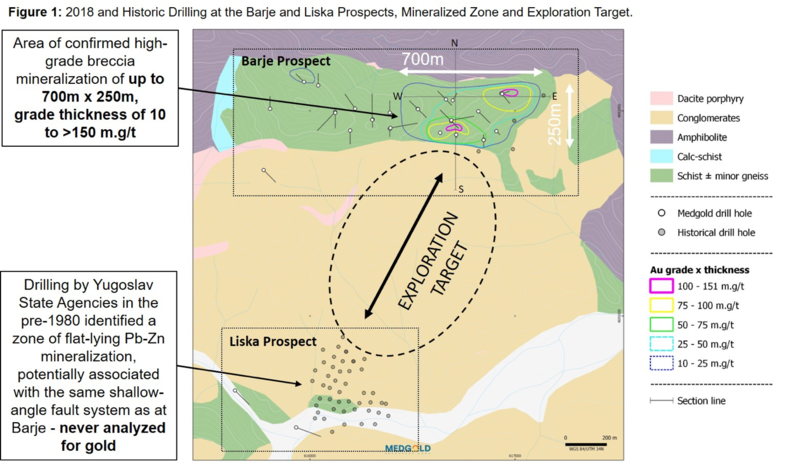 Base metal concentrations are lower at Barje than at Liska, but precious metals values are higher. At Barje, gold and silver mineralization with (earlier?) lead-zinc mineralization is hosted by gneisses and schists beneath younger conglomerates. Gold mineralization grading 1-3 g/t Au occurs over tens of meters within brecciated metamorphics. Higher gold grades up to 20-30g/t Au, are found in sulphide-matrix breccias developed on, or close to, the detchment fault. Liska is 1.5 km southwest of Barje. It was drilled in the 1950s and 1970s by the Yugoslav state which identified a lensoid-shaped base metal occurrence containing 1-2 wt.% combined Pb-Zn striking northeast towards Barje. The mineralization at Liska is located in tectonic breccias at the base of the conglomerate and parallels the slope of the detachment fault. The area between Barje and Liska is overlain by a thin layer of conglomerate. The exploration potential under the conglomerate is considered to be excellent. Medgold began exploring in 2016 and completed an extensive soil sampling grid, and IP geophysical survey, mapping and channel-chip sampling at Barje. Channel sampling at what is now called the Discovery Outcrop (CH_BAR_01-11) returned a best channel interval of 84m at 5.6 g/t Au and 105.2 g/t Ag. Sampling of an old adit returned 52m at 2.20 g/t Au and 88 g/t Ag. The Company completed a 39 line-km (4 sq.km) Induced Polarization / Resistivity (IP-Res) survey which identified a high chargeability anomaly extending to the west of the Barje outcrop under cover for over 1km. 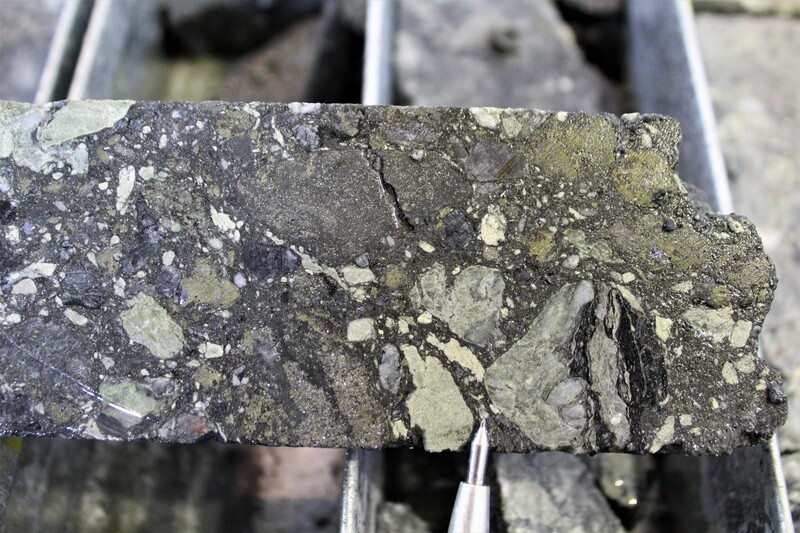 The anomaly is believed to relate to near surface, flat-lying sulphide mineralization at the contact of the basement rocks and the overlying schists. Medgold’s subsequent drill results support this geological model. 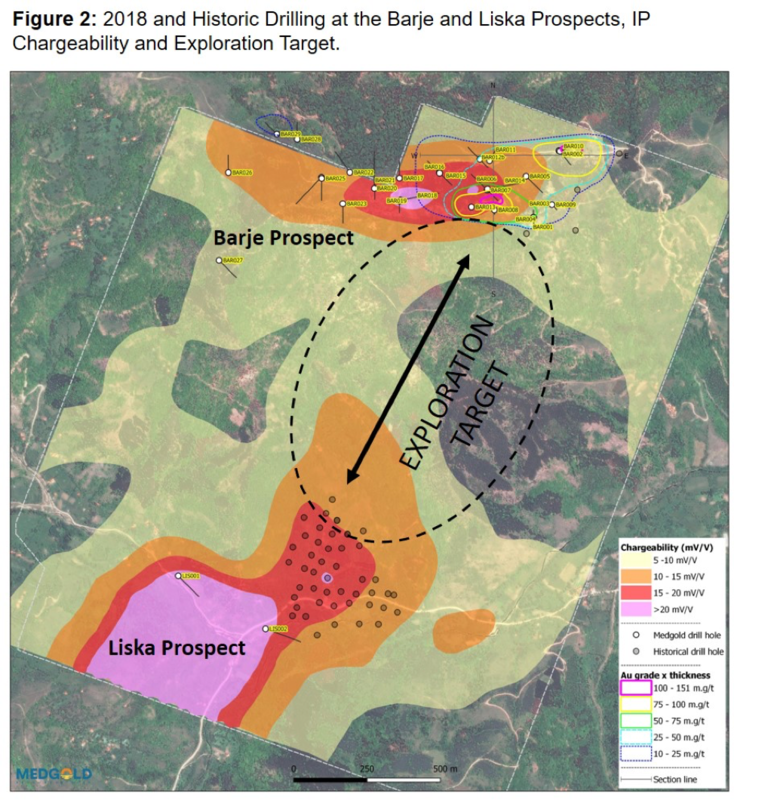 At Barje, a large high-chargeability anomaly -measuring approximately 1km east to west and 400m north to south- was identified just west of the discovery outcrop. The southern limit of the anomaly appears to track the regional detachment fault east to west. The anomaly continues northwards, which is considered to be the northerly extension of the same detachment fault, but beneath cover and steepening topography. Interestingly, the high-grade saw-cut channel sampling completed at the main Barje outcrop is located on the eastern flank of the chargeability anomaly. At this stage, it is unknown whether the chargeability anomaly is directly related to gold mineralization; however, schists exposed in the area of the chargeability anomaly display similar alteration and mineralization as seen in the schist stratigraphically overlying the mineralization at Barje. 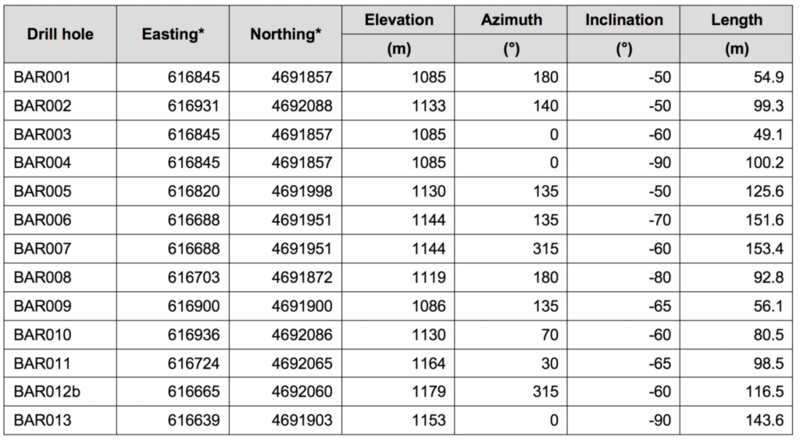 The Barje outcrop itself is observed in the chargeability data as a weaker NNE trending corridor; this also constitutes an exploration target to be followed up. BAR001, collared approximately 70m north of the Barje outcrop, was designed to confirm that mineralization extends in a third dimension along a north-northeast axis from the outcrop. BAR003 and BAR004 are both collared on the same pad as BAR001 and drilled in a fan array (BAR001 to the south, BAR003 to the north, and BAR004 vertical). BAR002, collared approximately 300m north-northeast of the Barje outcrop was designed as an up-dip step-out from the outcrop and BAR001. BAR005 is collared 160 m to the NNW of the Barje outcrop and drilled towards the southeast. BAR006 and BAR007 are collared 190 m to the NW of the Barje outcrop, with BAR006 drilled to the southeast and BAR007 drilled to the northwest. 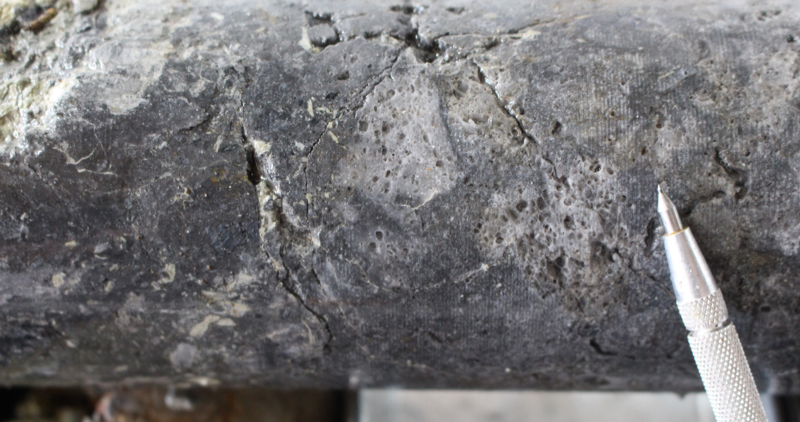 All three drill holes intersected intervals of approximately 100 m of moderate to strong sericite and silica alteration with precious metal grades increasing with depth. All culminate with intersections of 13-30 m of intense brecciation and sulphide mineralization close to the contact of the detachment fault. BAR006 and BAR007 are located on the eastern flanks of an IP-chargeability anomaly, considered to be associated with disseminated sulphide mineralization, which continues for at least a further 500 m to the west. The Karamanica target is located in the Surlica-Dukat Licence, approximately 8 km to the west of Barje. It is hosted by schists on the southwestern margin of the Crnook dome. The schists are cut by a series of large-scale northwest-trending faults. Medgold has completed detailed mapping and rock sampling, plus grid-soil sampling, with samples collected on a 200m by 50m grid. 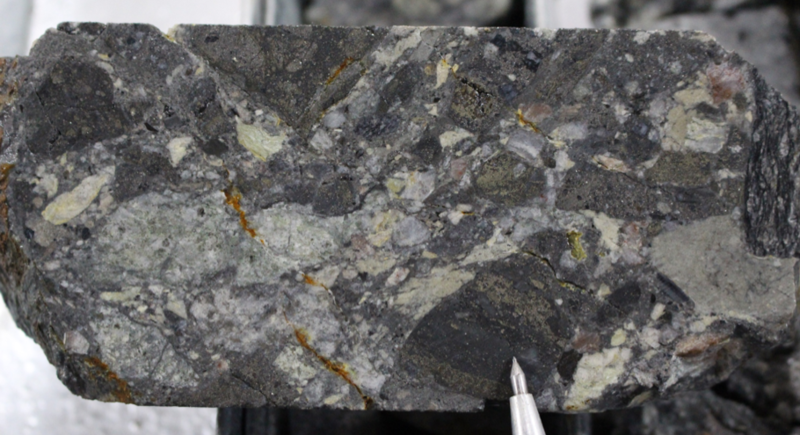 Initial reconnaissance work has identified strongly altered and brecciated felsic volcanics, locally significant calcareous schists, graphitic schists, limestones, and zones of galena-sphalerite and pyrite-silica mineralization. Despite poor outcrop exposure in the area, a total of 129 rock chip samples have been collected, with 14 returning assays greater than 1 g/t Au. The rock chip samples returned highs of 11.1 g/t Au, 7.1 g/t Au and 5.5 g/t Au, typically associated with the pyrite-silica mineralization. Soil sampling results define two large anomalies with consistent soil geochemistry with > 50 ppb Au-in-soil, within which are significant linear zones of >100 ppb Au. The first soil anomaly extends over an area of approximately 1km by 1km, and is associated with a regional northwest-trending fault, which offsets felsic volcanic rocks from basement schists and calcareous schists. The second, located approximately 1km north of the first anomaly, extends over approximately 800m by 600m. Mineralization occurs as disseminated or massive sulphides within the host calcareous schists. The same fault structure hosts blind massive carbonate-replacement Pb-Zn-Ag mineralization. In June 2016, Medgold completed a $1.5-million private placement to Fortuna Silver Mines (“Fortuna”) issuing 10-million units at $0.15 per unit. Each unit consists of a share and a warrant at $0.15 for one year from closing. Fortuna and Medgold subsequently formed a Strategic Alliance to generate new gold and silver targets in central and southern Serbia. Medgold also granted Fortuna the right to enter into an option agreement to earn up to a 70% interest of a selected project, by spending US $8 million in qualifying expenditures over 6 years. In late 2016, Medgold received its first exploration licences in Serbia which included the Donje Tlamino licence. Medgold subsequently undertook a program of channel-chip sampling at Barje (see above). In March 2017, Fortuna elected to option the Tlamino Project, and must incur expenditures of US$3.0-million to acquire 51% of the project within 3 years. To earn an additional 19% Fortuna must spend an additional US $5-million within a 3 year period, and complete a Preliminary Economic Assessment (PEA). In February 2017, Fortuna exercised its warrants for total proceeds of $1.5 million which was allocated for target generation in Central and Southern Serbia. Fortuna was granted the right to option a second project, on the same terms of the first. See press release January 9, 2017 for further details. See press release July 18, 2017 for further details. See press release November 15, 2017 for further details.